For a new water connection to a single domestic dwelling, youll need to get in touch with your regional water supplier. Many companies recommend submitting an application 3 months in advance, so if you need a temporary supply on site while you build, make sure you leave yourself plenty of time. Things are a bit simpler with the water companies because, unlike gas and electric suppliers, the company making the connection also owns the meters, supplies the water and sends you the bills. On the flip side this means there’s no choice of who supplies your water. The connection process varies between water companies particularly in regards to your responsibilities, so make sure you check the details with your local supplier. Find out which supplier covers your area. There’s a useful link at the bottom of the page. If you need a temporary connection while site work takes place and before the final installation, get in touch with them to discuss your needs. Site layout plans showing the proposed point of entry. Planning reference number for planning permission. Details of any rainwater harvesting or grey-water systems you intend to incorporate. Details of sprinkler systems if applicable. A land risk assessment if there is a chance the new supply pipes will cross any potentially contaminated land. Details of the plumber who is completing your plumbing installation. 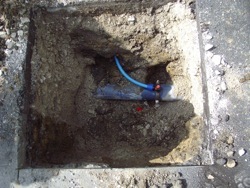 Details of the contractor who is laying the supply pipe from the boundary to your stop tap. Details of your plumbing installation. When you receive your quotation, check the details, sign on the dotted line and make the payment. You will need to complete the plumbing installation in your new home and excavate and lay the supply pipe from the stop tap to the agreed entry point at your property boundary. 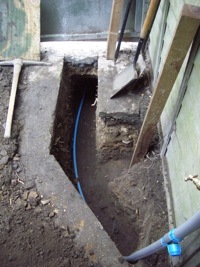 Once you inform the water company that the supply pipe and plumbing installation are in place, they will arrange for any neccessary inspections. 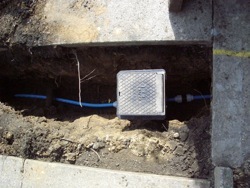 When they are happy with your side of the supply they will provide a connection date when their contractors will tap into the nearest main and provide you with your new metered connection. The biggest difference in this process is in how water companies discharge their obligations under the Water Supply Regulations 1999. These regulations were designed to ensure the safe and efficient distribution of water, preventing waste, contamination and misuse. Whilst it is up to you and your plumber to install everything correctly, it is up to the supplier to enforce compliance with the regulations. This could be done through your use of an accredited contractor such as through the Water Industry Approved Plumber Scheme (WIAPS) or by the supplier carrying out inspections of the supply pipe and the plumbing installation at your property before making the connection. Once again, check with them for details. Costs for a new water connection can vary greatly and are dependent on a range of factors such as where the main is in relation to your entry point and whether the supply company has to excavate unmade ground, pavements, or roads to make the connection. There are two main components to the connection charges. The first of these is the connection charge itself which you can expect to be in excess of £550 and the second is an infrastructure charge which is levied to take account of the additional load of a new user on the entire water supply and waste water systems. The infrastructure charge is normally around the £350 mark for water and the same for waste water. At the time of writing, if you are self building, new water and sewerage connection services are zero rated for VAT and the charge shouldn’t be added to your quotation. If your new build property is a long way from a public main and it becomes necessary for the water company to extend the main, these costs will be passed on to you although an adjustment will be made to reflect the value added by future revenue generation from the additional main and connection. To idenify your regional supplier, visit Water UK who represent all the major UK water and waste water service suppliers in the UK. The link below takes you to a list of all the water supply companies in the country. Click on the map if you aren’t sure which one covers your plot. Youll find lots more information on your local supplier’s website including indicitive costs, lead times, and details of the process including your responsibilities. Wastewater services and sewer connections require a separate application but in many (although not all) cases this will be through the same company.